Poor Simon really got the b-list selection here, didn't he? Although I am kind of in love with Karen's cow-print skirt with purple tulle. Strangely enough, this didn't feel much like a quickstep, it's a very difficult one for someone with no dance experience like Simon and he did look like he was jogging about a bit. I was quite looking forward to this, the rehearsal footage on ITT looked quite good and they had a cracking song choice. Thankfully, this didn't get overwhelmed by the theme, but it also didn't get overwhelmed by anything, and was a bit dull. Also, Anton just seemed to leave her on her own and wander off at one point. Saying that, she has definitely improved from week 1, so I'm happy for her to stay for a bit. This was weird, weird, weird. I wasn't sure what I was supposed to be watching, especially with the 80s power ballad version of Climb Every Mountain. They didn't know what Maria 'look' they were going for, with the apron plus wig making her look like Cersei Lannister posing as a peasant. And AJ seemed to have decided the more time Mollie spent in the air the better. There seemed to be some decent ballroom hold and footwork in there, but I was totally baffled. I am now spelling Dianne's name properly, sorry everyone! Now the rev hasn't been the higher calibre of comedy contestant yet (more Dave Myers than Ed Balls), but you'd think Flash Gordon could get him there. Sadly, I feel like this just missed the mark, despite Dianne putting plenty of paso content in there (and looking totally awesome), he just hasn't shown the ability yet to really sell a dance properly. Well after a rather lacklustre start, Debbie has come to bless us with her high-camp cougar ringerness. Yes, it wasn't as rip-roaringly fun as her paso or as twee as her waltz last week, but it was easily the best of the night so far and was beautifully executed. Debbie also makes me like Giovanni more, so I'm all for that. Our poll last week showed a lot more of you thought Brian should have left rather than Chizzy, but fair play to him I think he raised his game this week. They'd obviously worked on his ballroom skills and Amy put a good routine together, although he is still a bit tentative. However, he definitely exceeded my expectations and it wasn't a complete gurn-fest, so for that I'm grateful. This was sold a lot during the week, yes the theme seemed a bit bonkers, but the training footage also looked good. And yes, it was bonkers, but Gemma is really coming on in leaps and bounds - she was dancing alone in it for so long but looked like she was really enjoying herself. The lift was seriously clunky though. I could actually have done without Aljaz dancing as a pregnant teddy bear because I found it a bit distracting. I am so over Charlotte's cha cha drama, she did a bad dance, get over it. Now let us return to Brendan's 80s fantasies...and not a totally awful tango song choice actually. However, Charlotte still dances very passively, like she's having some sort of terrifying out of body experience. There are times when she has some nice lines and shows potential in hold but she's got a mental block it's going to be tough to get over. I still can't get over how bad Oti's outfit was when you consider all the glamorous 1930s outfits you could put her in for Indiana Jones, Willie Scott wore a sparkly floor-length ballgown FFS! Jonnie looks awesome though, even when his face is covered in half a tub of Bisto. This was a great routine with loads of choreography which I was impressed Jonnie could handle compared to his tentative week 1 routine. Great in hold, good footwork, slightly leaden arms (but his arms consistently need work) - keep on improving Jonnie! Well this was delightfully bonkers! Loved Susan leading, and when she span Kevin on the floor I actually shrieked, along with the customary shout of 'samba rolls!' whenever I see them - and these were actually pretty good. In fact, there was a fair bit of samba in this performance, and some bounce action. They'd obviously worked very hard on this in a week when they cold have easily coasted on camp, cracking job guys! We've learned this week that Joe can grow some pretty impressive facial hair in the space of a week. Also, Katya is good in furry headwear. This was rather lovely, with a sweet song and more than enough choreography. Joe was probably better in hold than out, but it's a Viennese Waltz so that shouldn't be a problem. I also quite enjoyed Katya being all tragic heroine with dramatic facial expressions and Joe just beaming away like he was having a marvellous time. The greatest movie themes in the world....and some random nonsense from Trolls. 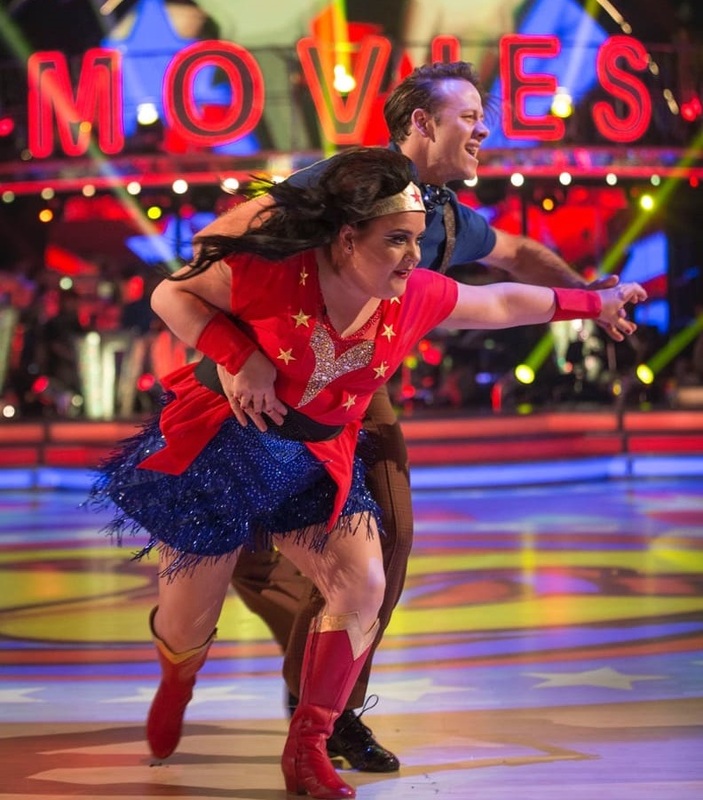 I enjoyed this more than last week's salsa, mainly because there were no lifts and it did look like a cha cha underneath those terrifying day-glo outfits. Still not properly warmed to them, but this week I only rolled my eyes at the scores, rather than them. They'd given themselves a tough act to follow after the barnstormer of a paso, but this was was a complete delight. So light and charming! Props to Gorka for for such a lovely routine, and not going to town on the lifts, just sticking with her amazing musicality. I even got over them using half the props from the Eastenders market cluttering up the place, long may they sail. Oh look, disco-samba returns to haunt us yet again...just make disco it's own category! Saying that, I actually think this was Davood's best so far: he came out and sold it and wasn't totally overshadowed by Nadiya. There was also some samba content in it...at the beginning before he ran off up some stairs to sexually harass the judges. Darcey was right though, they have energy, but they're also often a bit frantic, but this week it was a bit more coherent.